In my attempts to convert my husband into a noodlemaniac like myself (or at least someone who will tolerate eating soup noodles several times a week), I have taken him to countless noodle shops. We’ve sampled and slurped our way through just about every variety of Asian noodle, and ramen has had the highest hit rate. My husband hearts Katana-ya, dreams about Gomaichi, and even sneaks in secret trips to Ippudo without me. Of the three, his favorite is definitely Gomaichi, with its sour-spicy sung hon men, an oddly addicting variation that neither of us has ever seen anywhere else. Since the idea of having only one source of any favorite food makes me break out in a sweat (not to mention that Gomaichi is located in Honolulu, a fair skip for a bowl of noodles), I knew I had to try and recreate the dish at home. Sung hon men appears to be Gomaichi’s original invention, so I had to work off of some traditional tan tan men recipes and find a souring agent independently. I experimented with rice vinegar and blended ume plums before landing on limes. I wasn’t able to get the exact smoky, savory depth of Gomaichi’s broth, but this home-cooked version has a lightness that is, in its own way, just as nice. Incidentally, tan tan men is the Japanese version of the Sichuanese dan dan mian, which is another of my favorite noodle dishes (there are so many). 1. Take 2 pounds of meaty pork bones (ask the butcher to hack them up for you) and place in a large stockpot. Fill pot with water until bones are just barely covered. Add ginger, green onions, peppercorns and star anise (you may want to place these last two in a mesh tea/spice ball for easier removal). 2. Bring to a boil and skim off any scum that appears. Add rice wine and lower heat to a simmer. 3. Simmer for at least an hour (preferably two), skimming off any scum that appears. Salt to taste. 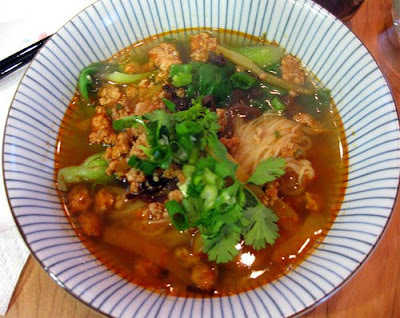 ½ cup of slivered zha cai (Szechuan preserved vegetable). Rinse slivers thoroughly; they will be too salty otherwise. 1. Heat oil in heavy-bottomed frying pan over medium-high heat. 2. Add ginger and serranos and stir until fragrant (about one minute). 3. Add garlic. Stir. Add a touch of pork broth if necessary, to loosen the mixture. 4. Add ground pork and mix well, breaking up any large pieces with a spatula. 5. Add spicy bean and sesame pastes, cayenne pepper, and Szechuan peppercorn (if using). Incorporate all seasonings well. Cook for about 2-3 minutes. 6. Add zha cai. Mix well and continue to stir until pork is cooked through. Turn heat to low and cover to keep warm. 1. Clean any veggies you plan on adding. I like Shanghai bok choy hearts. 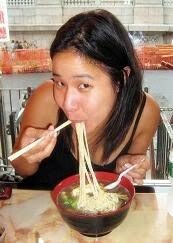 Fresh ramen noodles are available at many Asian markets. I use noodles labeled “wonton noodles” and I always look for the freshest looking noodles available. 2. Boil a large pot of water. Cook noodles according to package instructions. Fresh ramen noodles take about two minutes, which is coincidentally how long Shanghai bok choy takes. I cook both at the same time, in the same pot. Cooking times vary depending on the vegetables/noodles being used. 1. Place noodles in the bottom of your bowl with veggies on top. 2. 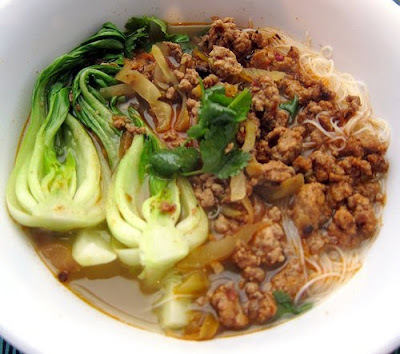 Place a generous scoop or two of spicy pork topping on your noodles. 3. Add two ladlefuls of pork broth. 4. Garnish with a couple sprigs of cilantro. Squeeze the juice of half a lime into the bowl (or a whole lime, if you prefer your soup very sour). 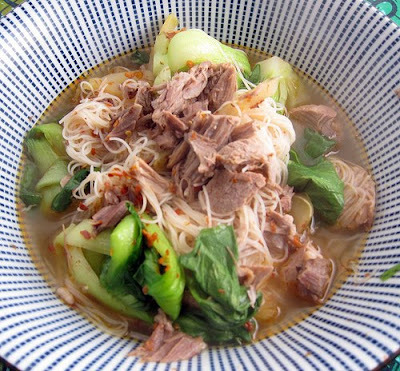 Should you be lucky enough to have any leftover pork broth the next day, here's an easy noodle dish that you can make with the meat from the bones. 1. Cook noodles according to package instructions. You can boil your veggies in the same pot. Cooking time varies depending on the vegetables/noodles being used. 2. In a separate pot, heat the meat (removed from bone and roughly shredded) in the two cups of broth. 3. Drain noodles/veggies. Place in a bowl. Add slivered zha cai. 4. Pour hot broth/meat over. 5. Season with spicy chili oil to taste. Oh my gosh, this looks soooo delicious! I'm always on the lookout for new noodle recipes because my fiancee is also a noodlemaniac. This one is not only unique but looks absolutely delicious! I'll have to try it soon and I can't wait to see how it tastes! That looks an absolutely groovy recipe. The trouble is it's so involved for... well, noodles, even though I'm sure it's exquisite.